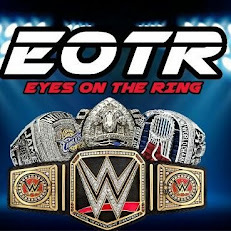 As the Royal Rumble nears, you'll be seeing some more Rumble related articles from us here at EOTR. 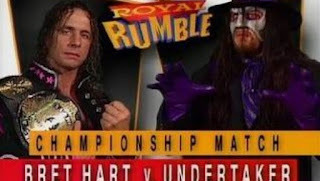 With that being said, today, Phranchize and I decided to sit down and combine our opinions on a list of 10 of the best World Title Matches in Rumble History. This list might be controversial, but if you disagree, feel free to share your favorite matches in the comments below. Let's take a look. -CM Punk was wrestling’s hottest star and management (John Laurinaits) wanted him out as champ. Ziggler earned a title shot by pinning Punk and as a result, we got this match. I felt this was one of Ziggler’s best performances even though this match was overshadowed by the rivalry between Punk and Laurinaitis. It was great action all the way through however and Ziggler showed why he deserved more during this time period. -Even though this was just a continuation of the Undertaker vs Kane feud, this match was still fantastic. 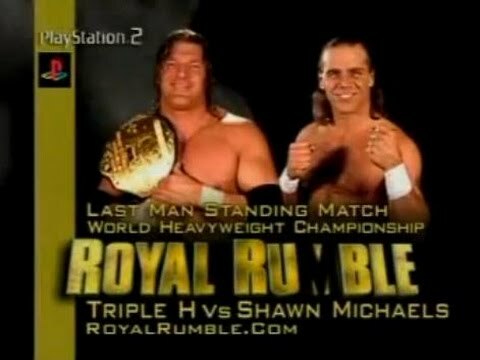 Sadly, Shawn Michaels would suffer the wrath of this brutal match as he lost his career for four long years following a tough bump on the casket. Shawn wins the match, but loses something more valuable in the aftermath. -I (Phranchize) really feel that this match is so vastly underrated. It’s rare that two face wrestlers get in the ring and even with the contrast in styles, this match was brilliant to me. The ending wasn't the greatest way to close it out, but it helped both to keep their momentum. 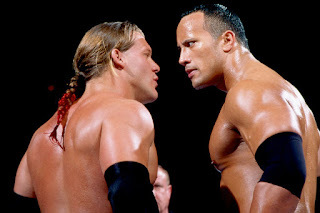 -Jericho was in the prime of his career and so was The Rock. This match was one of the best of both men’s careers and you could tell that Jericho was out to prove he was no fluke and that he was main event material as the Undisputed Champion. 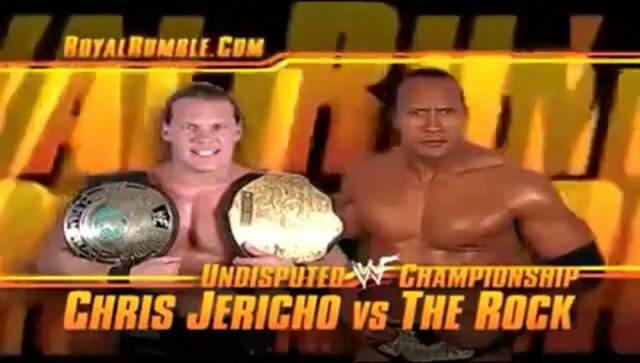 Jericho wins and cements his legacy even more. -The most brutal and vicious match on this list. The lines of reality and fiction were blurred with this one. Mankind would suffer the most brutal chair shots that we had seen up until that point in WWF. It was a bloody and gruesome match that saw The Rock steal a victory (literally) when it was all said and done. 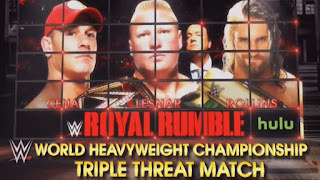 -A choice from True, this match is one of the most fun matches in Royal Rumble history. 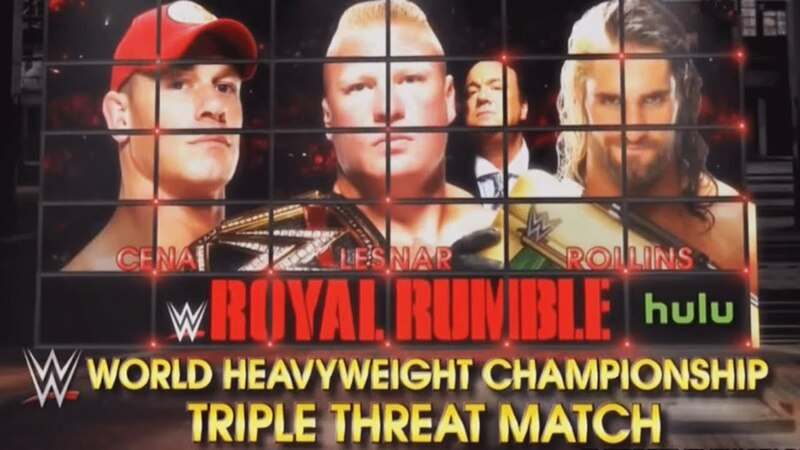 It features Cena, Rollins, and Brock going at it for the WWE World Heavyweight Title, and for Rollins, this was the match that made me a believer. With his knack for high flying and stealing the show, Seth did just that, as Brock took time out of the match (he barely wrestles longer than 10 minutes nowadays), while Seth and Cena delighted the audience. Brock walked away with the win, but Seth is the MVP of the match hands down. -One of the most brutal matches I’ve ever seen. You can tell these two laid it all on the line in this one. Although we didn’t get a decisive winner, the decision honestly didn’t hurt the bout. It honestly seemed more fitting that neither man won. You have to revisit this classic. 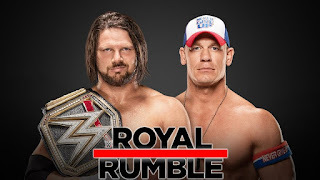 -A recent classic that was tough to place, Cena vs Styles is one of the best matches of 2017 and one of the best matches in WWE Royal Rumble PPV history, which earns it the title of being top 3 here. 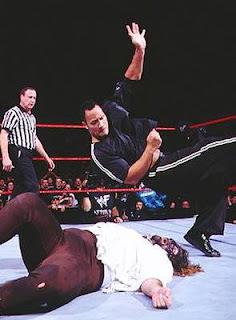 I could have put it over Angle vs Benoit, but it just misses that level of greatness by a small amount. The overuse of finishers is the only knock against this match, but at the end, Cena wins title no. 16 and AJ doesn't look weak losing his title, so it worked out okay for the most part. 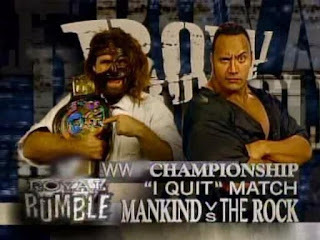 This match is a classic regardless of result however. 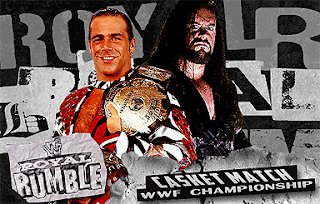 -One of the best wrestling matches of all time. These two put on an absolute clinic. Benoit proved that he was worthy of being in a main event spot with one of the best of all time. The action was full of fire and Benoit was closer than he had ever been to walking away with the WWE Title. While many would consider this the best of the best, and it is very close, it just misses the no. 1 spot. What takes no. 1? 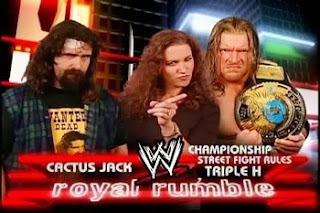 -Hands down, the best World Title match in Royal Rumble history. Triple H showed a side of himself that up to that point had never been seen and we all know what Cactus Jack brings. 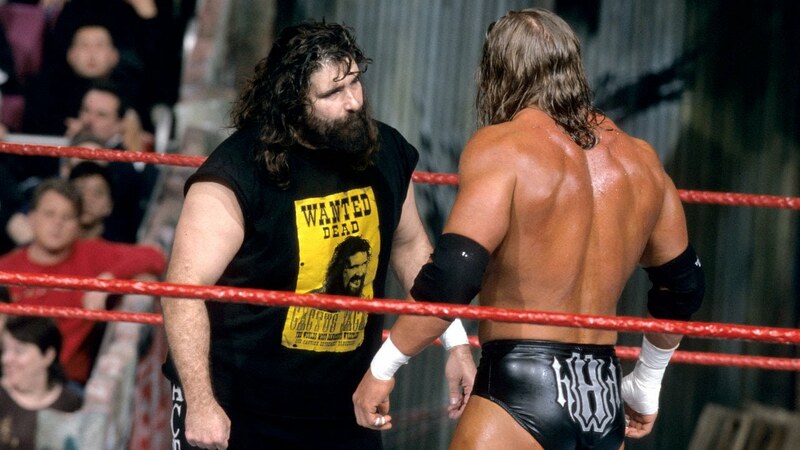 Throw in the Street Fight rules and you get a classic that took Triple H to the next level and allowed the world to see that Mick Foley was still one of a kind in the ring.